Who is Jungle Jane's Conservation? Why does the government of Costa Rica not take care of the rain forest? The laws of Costa Rica are very poor with respect to conservation of the forest. Their hands are tied. Should no one put in a "denuncia" the people of Costa Rica are free to cut down whatever they like. Jungle Jane's Conservation does have the full support of SINAC in whatever way we can conserve the forests. Why do the Costa Ricans keep cutting down the trees? 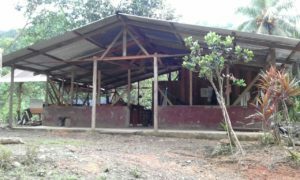 The Costa Rica government does not provide sufficient funding or incentives to keep forests in conservation so the land owners of these areas exploit what they can. Most would be happy to just sell the land. Others cut down the tees for cattle or agriculture. But really, only the wealthy have enough money to own cattle. Agriculture is also expensive, as fertilizer and pesticides are required to ensure a good crop. What do you plan on doing with the money you receive from donations? The Jungle Jane project will give us the funds to either purchase more land to keep in conservation to provide monetary incentive for the people not to exploit the land. Having lived as a local for 15 years, Jungle Jane is in a unique and wonderful place. She has been granted the vision to see both worlds. Jungle Jane has observed much and has learned and seen a lot. She is accepted, respected and trusted as a local in the community. Many foreigners live in Costa Rica, but that is how they live - as foreigners in Costa Rica! Jungle Jane lives completely as a local and thus she has gathered a great deal of knowledge of the culture and customs. The Jungle Jane project is one of education for the locals and the foreigners. False impressions lead to false attitudes and ideas. We hope to change minds and attitudes. Why did you start Jungle Jane Conservation? Years ago when Jungle Jane lived in Canada, she donated to WWF buying acres of the rain forest in the Amazon as a Christmas gift for her two young daughters. After living in a 3rd world country for as long as Jungle Jane now has, she has seen that very little, if anything, has ever reached the rain forests that Jungle Jane had so hoped to protect. The Jungle Jane project will see all the money going to protect the rain forest! he laws of Costa Rica are very poor with respect to conservation of the forest. Their hands are tied. Should no one put in a "denuncia" the people of Costa Rica are free to cut down whatever they like. Jungle Jane's Conservation does have the full support of SINAC in whatever way we can conserve the forests. In 2005, right after hurricane Katrina hit New Orleans, Coast Rica was hit by Rita. I was in the most devastated area of the hurricane. The village where I now live was completely destroyed. It was very small - 20 houses. Luckily everyone managed to get to safety. There were no fatalities. My friends emailed me worried . They had seen in the newspaper 125 people were killed as a result of the hurricane and they sent donations to help. I was baffled. No one died. The town was wiped out and we lost everything - but no one died. A lot of money was donated, but we never saw any of it. A couple of bags of used clothes, a bag of food and a blanket was what we got. Out of all the dollars donated to a town with a population of less than 100 people, that is all we got. That town remains uninhabitable except for one person - me! So I can guarantee that your donation will go directly to the source and will not be swallowed up by any government or institution!! In 2009 I got a job at a laboratory for road construction in the extension of the main highway. Being a woman in a male dominated society is very difficult. They wanted me to cook, clean and wash for them. I wanted to do the material testing. In Canada I studied Environmental Engineering and worked for the Ministry of Environment in Toronto and then at the highest accredited private laboratories in Canada in organic toxicity. I did manage to get the lab position (the first woman in Costa Rica to do so.) I also had to cook and clean and get paid half of a man's salary! There I learned a lot about government corruption. I was told to falsify documents when the materials did not meet specifications. I told them that I could not falsify documents. My standards, principles and values are high - I am a Canadian. My boss informed me that if I did not falsify the documents and show that we have viable material, we would not get government funding. And if we did not show we have viable material we would also not get international funding "So falsify the documents" I was told! My career ended shortly thereafter as I was unable to comply with their request. If you have ever driven on a road in Costa Rica, you now understand why they are do bad!...And that is where your international funding dollars are going. What will you do with the land? The land is not being used for anything! It is being kept in conservation strictly in its natural state. Untouched where it supports an unfathomable amount of life! Very few Costa Ricans still know (or have interest) in the secrets of the forest. Forest life is hard. The secrets are being lost in development of the land. I seek out individuals who retain this knowledge to work with me and teach me. What will you do with the money donated? Monies donated will go to land purchase, incentive programs to locals to preserve the forest, paying the workers, legal fees and fencing material. Jungle Jane's long term is to retain as much land as possible in its forested state. Also to reforest areas that have been depleted and to provide educational programs for locals and foreigners. Jungle Jane hopes to change minds and attitudes that planet earth exists for all living creatures great and small! Planet earth was not made to conquer and destroy, but rather to live and enjoy.